The objective of the cell is to provide a strategic platform to synergize and facilitate interaction between academia and industry with an idea to provide Visual Arts student exposure to the industries, creating opportunities for student’s project-based learning like graduation projects, industrial training and classroom projects; By providing a meeting ground where the prospective employer can identify suitable candidates for recruitment in their organization. This event also creates awareness among the industries about CVM College of Fine Arts and its various modes of operations. Students are encouraged to pursue opportunities in areas such as Social Communication, Service Sector, Green Design, Universal Design and Experiential Design. The quality of education received by Visual Arts Graduates has contributed to their success at various levels across diverse segments of the economy; their work and ideas have been duly acknowledged nationally. The company registration starts from January 2019. 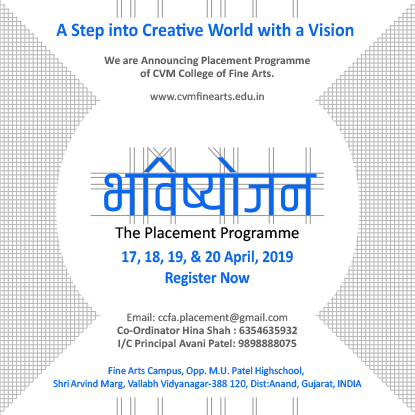 The participating companies for placement week 2019 are requested to fill in the below attached registration form to help us plan out and help make your interaction with CVM College of Fine Arts more fruitful.